This is a 30 minute activity that introduces some basic characteristics of writing we may not usually focus on. Write one sentence that expresses your opinion on the statement “Writing is important”. 1.1. Theoretically, it could be any statement, but, if we want students to think about writing, it is preferable to focus the topic on writing, too. 1.2. Students can be informed that they can agree or disagree with the statement, they can explain it, paraphrase, develop, bring examples… simply any reaction is correct. 1.4. It is essential that students are instructed to write one sentence only, long or short, but one. The reason is that when we discuss writing later in the step 4, students should also realize that one sentence expresses one idea. Students are asked to pass the paper to their colleague sitting on their left. They should read the sentence their colleagues have written and write their own reaction to that. They can agree, disagree, develop the idea or come up with a new one - simply, anything is possible again – it only has to be a clear reaction to the first sentence, and it must be only one sentence again. 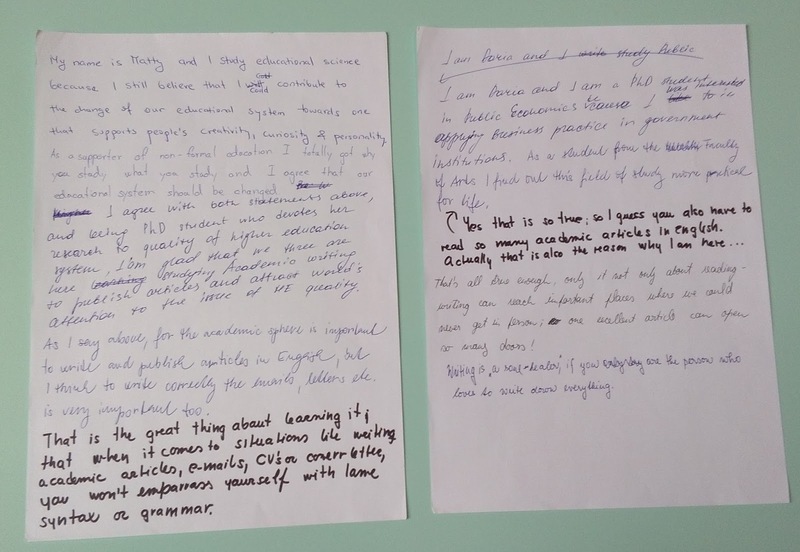 When all students finish, they are asked to pass the papers to their colleagues sitting to their left again and do the same – read the sentences of their colleagues and react to them in one sentence. This can be repeated as many times as we like, but the more text, the longer each change takes and the activity can become difficult to handle. 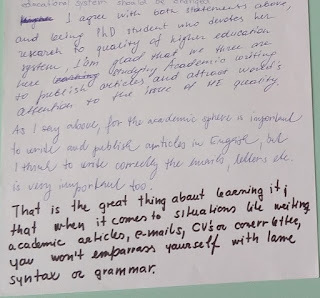 In my experience, if each student writes their own original sentence and four reactions, it is usually enough for them to get some immediate practical experience with writing to talk about. Then, students are asked to send the papers back to the authors of the original statements. They can read the collaborative texts they have produced. 2.1. It takes different amount of time for each student to read and write their sentences. We should not push the slower students to hurry up, as it is one of the goals of the task to realize that writing is individual. 2.2. There can occur different reactions of students during this task. We should not stop any of them, as students are going to reflect on what is going on later in the next step. Students are asked to recall what was going on while they were engaged in the task and they should write as many characteristics of that activity (writing) as possible. They can produce adjectives or descriptions. They should reflect on what was going on, what it involved, and/or also what they observed. Students are asked to discuss their ideas with the rest of the class. The teacher writes all points on the board and draws attention to the ideas which are essential for writing practice. 1) Writing is an individual activity. 2) Writing is a form of communication. 3) Writing takes time –different time for each person. 4) The same idea can be expressed in many different ways. 6) In writing, we tend to formulate our views and ideas more carefully and precisely. 7) Each sentence is an expression of one idea. 8) Writing can be improved by writing. I use this activity usually at the beginning of a course focused on writing, or at the beginning of series of activities focused on writing. Sometimes, 30 minutes is enough, in many cases, however (especially in groups with rather diverse needs, skills or experience of the group members), it is worth having a longer discussion on what writing includes. Thank you for allocating this compelling information here between us. I truly admire you for your efforts you take to write this long article for us. Keep sharing your guidance. Thanks. I am happy that it is useful and I hope I will find some more time to get back to writing these posts again. It is a really interesting lesson plan. Thanks alot for sharing. Thanks. I am glad it is useful. Academic Writing Pro provides you professional essay writing services so that you don’t have to taste that bitter pill and everything actually goes like a piece of cake for you. Helpful blog about Importance of Writing. I appreciate it for sharing.